Myringoplasty is one of the commonest operations performed on the middle ear. Our aim was to compare the results of endoscopic permeatal myringoplasty with that of conventional myringoplasty by post aural approach using operating microscope. 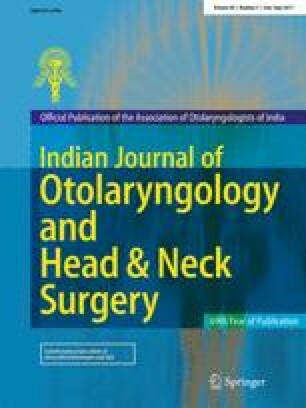 A total of 120 patients having central perforation of tympanic membrane were randomly divided into two equal groups of 60 patients each. In the first group, endoscope was used and in the second group microscope was used to do myringoplasty. Temporalis fascia was used as a graft material. The patients were kept in follow-up for 1 year. The pre-operative and post-operative audiograms, post-operative pain, graft uptake and time taken for surgery were compared in both the groups. The graft uptake rate was 91.67% in the endoscopic group, whereas it was 93.3% in the microscopic group. Post-operative pain was significantly less in the endoscopic group as compared with microscopic group and not much difference was found in the gain in A-B gap in either group. The mean ABG gain was 16.16 dB (SD = 4.68) in endoscopic group and 19.54 dB (SD = 3.45) in microscopic group. On applying the Mann–Whitney U test, this finding was statistically significant (p value = 0.0001). In our study success rate was equal between endoscopic and microscopic technique. In terms of morbidity and postoperative recovery endoscope produced better results. Endoscopic tympanoplasty can be a good alternative of microscopic tympanoplasty.